I had an evening on the water with the new TFO Prism Reel last night, and first impressions are in the books. First, let me just say I am one of those “go to the reel!” guys, meaning I try to go to the reel on every fish that ranks in size. Sure, strip in dinks, but as a force of habit, consistently going to the reel makes it a lot less difficult to go to the reel when its real necessary. If I were an instructor, that would be the next thing I tried to ingrain into my students (after casting), GO TO THE REEL. Think about it; all we have in our hands when we fly fish are a rod and reel. The reel is the often ignored technology that, by properly applied drag, can help you land more fish. It’s just that simple. If you want to see an example of the mess you can get by not going to the reel, be sure to watch the episode of Addictive Fishing where they are fishing for Florida snook. My BBS4 Barstock Battenkill by Orvis has developed a finicky drag that has only two settings – all off and full on. The BBS4 was on my eight weight rod (a TFO Clouser), so I went with the 7/8 Prism sight unseen. When I opened the box, I was surprised at the physical size of the reel, dwarfing my BBS reel. At the same time, that’s what a “large arbor reel” is – large. With a typical warm water fly line, the Prism holds 200 yards of 20 pound backing, and there’s just enough room for a fat bellied line to fit in – do yourself a favor, if you like room on your spool, and go ahead and leave 25 yards off the spool. The reel’s finish matches the price, with visible rough edges from what I assume to be a lower grade aluminum, or poor machines for machining, and that appears to be the case on the aluminum drag knob as well. Does it effect performance – heck no. The drag on this reel is super smooth and has several levels of adjustment. One thing to remember is to always back off the cork drag when the reel is not in use. If the cork remains compressed, it shrinks and loses its effective range of drag. This reel freewheels better than any reel I own – Lamson Litespeed, Tebor or Orvis – and is fractionally priced. You will be able to pick up line very quickly when going to your reel, and if you forget to set your drag, you will be dealing with “backthrash” not backlash. The TFO Prism Machined Aluminum reel will not win any beauty contests, but on first impression, this reel is a keeper. With line and backing the Prism 7/8 perfectly balances a TFO Clouser eight weight, and I feel much more confident in the Prism when going to salt in the near future. The Orvis goes to the shop, and back in the lineup as a backup reel. The next time I get to test the drag, once I get big fish on, and the heat off … then maybe we can see what this real is made of – DEEP DOWN, and we’ll let you know. If you have a Prism, either machined or cast, what are your impressions? This could definitely be a reel worth carrying on my site, if only TFO would allow non-brick-and-mortar outlets for their product. Time will tell. Where did you see that? What would those prices be? Reselling? 8/13/10: Just in today! 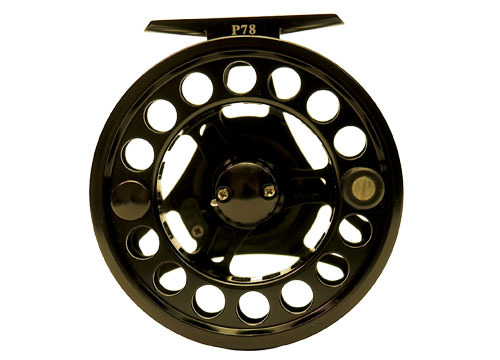 TFO is discontinuing the machined version of the Prism Large Arbor reel because performance, durability, and sales of the cast version have been so exceptional. Their thought: why charge more for a machined version when the cast version performs just as well and is just as durable? I just ordered 4 MLA 7/8’s at an unbelievable price! put a few more big ole trout to hand with that same reel on some private water in the east a few months ago…steelhead sized rainbows w/matching attitudes that almost never get fished. can’t take you to those. sorry. out of my control and beyond my paygrade. and i’m en route to florida now with at least 3 prism reels in my arsenal. Slight correction – the Orvis BBS is actually designated MA4 (mid-arbor). I was begining to wonder if you had gotten it yet. Take to me your impressive fish, and I will bring the reel amigo! I’ve got both machined and cast versions of this new TFO reel in a few different sizes that I use for fresh and saltwater fishing. And I’ve been using the first ones now for about 9 months. You are right about the mechanics: drag and bearings on these reels are competitive with reels costing 2-4 times more. And since they carry the TFO warranty, are we really all that concerned about long-term wear and tear? Hmmm…. Anyway, the way these reels are deep-anodized, they aren’t the prettiest things to look at. Then again, neither was a Jeep CJ-5. But when my 1976 Jeep CJ-5 ploughed into that oncoming Lincoln Navigator at 30 mph, it was the Navigator that had to be towed away from the scene of the accident. I drove home and ordered a new blinker! They had to pick up his rear axle, rear bumper, and rear quarter panel and put it on the flatbed with the rest of the truck. LOL That old CJ-5 was dangerous as Hell, but it was indestructible. But the TFO CLA and MLA are much sweeter behaving reels with far smoother and stronger drags over a wider range of settings. And they do look nicer than the plastic ones to be sure. Even I have to admit those ARE ugly. But I also like the smaller size and lower weight for the same line + backing capacity that these new TFO reels have achieved – even when compared to their own previous models. I’ve hauled in some mighty impressive fish on these TFO reels in the past 9 months. They’ve gotten a good testing. And I couldn’t be more pleased with a product for the price.